Paul Gipfel is standing with his arm raised at the far left. Seated at the lower left of the group , wearing a light shirt, is Dave Sear. Above Dave's left arm, standing, is someone I think named Michelle. Behind Michelle's head, sitting on a cot and leaning on his elbows, is Eddie Klein. Right next to Michelle, with a guy's arm on your shoulder, is Rena Gluck. Below Rena's belt buckle is Doris Blumberg's (now Lubell) right shoulder. To the right of Doris, wearing a white t-shirt and a bandana around his neck, is Ira Mansfield. 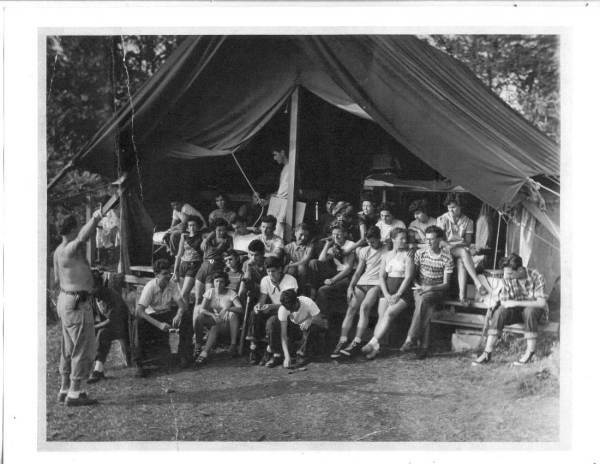 Sitting inside the tent, behind the tent rope a young man is holding, is Judy Treistman. In the back row, to the right of that young man, is Tagorah. To the right of Tagorah, apparently nuzzling the young man in front of her, is Mona Schneider. To the right of Mona is Shelly Grunor (now Schneider). And to the right of Shelly is Monita Kitzes.